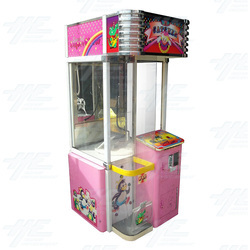 The W & P Catcher - Special Super Claw Crane Machine is a large 1 player arcade crane machine which is designed for large style plush toys and is loads of fun for players of all ages! Game play is simple and straight forward, players simply grab the joystick and use it to position the claw where they want, then when they are ready they push the button on the top of the joystick to drop the claw and pick up the toy! This fun and exciting game with large plush toys is easy to use, easy to maintain, and enjoyable for players of all ages. Game play is simple and straight forward, players simply grab the joystick and use it to position the claw where they want, then when they are ready they push the button on the top of the joystick to drop the claw and pick up the toy! This fun and exciting game with large plush toys is easy to use, easy to maintain, and enjoyable for players of all ages.